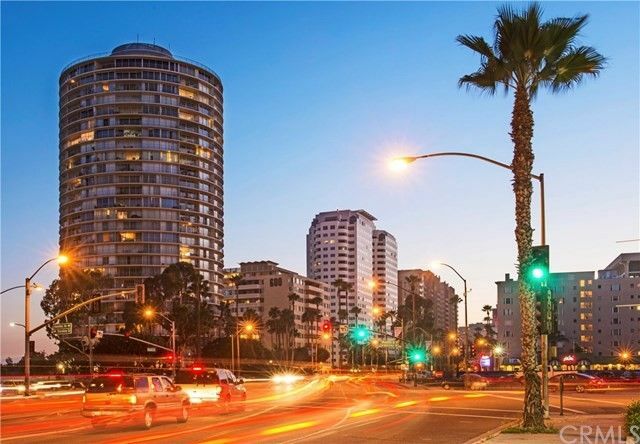 The famed International Tower has always been a Long Beach Icon and featured in many Hollywood films and this home embodies that same glamour along with offering the some of the best panoramic ocean views all the way down the coast to Newport Beach! The views only get better at night as the city lights come alive and this highly desired location affords dramatic city and mountain views too! The interior of this fabulous home has been meticulously upgraded and includes high end details such as Porcelanosa tile, stunning wood floors, solid core interior doors, expanded and built out master bedroom walk in closet, Quartz kitchen counter tops, custom kitchen cabinetry, smooth ceilings, custom interior paint, upgraded stainless appliances, recessed and custom lighting throughout, remodeled bathrooms, custom mirrored wall to reflect the dramatic views from every angle, automatic blinds, full size washer and dryer, custom framed and mirrored closet doors and more! This stunning home also offers a full wrap around balcony and floor to ceiling windows to enjoy your stunning ocean, city and mountain views! Unmatched in quality and located in one of the most desirable stacks in the complex you will not be disappointed in this residence! Two parking spaces and a rare additional storage room! 24 hr guard, pool, gym, rec. room, onsite manager and a fabulous location just steps to the beach, shopping, dining, and all that the rejuvenated Downtown area has to offer! FHA and VA approved!